The Northern Rivers region of NSW is a great place for a weekend getaway, family holiday, or business trip. The laidback coastal town of Ballina is in the heart of the area, and is a great base for exploring the area’s waterways, outdoor activities, art galleries, and so much more. When planning your travels, you’ll want to be sure to select the best Ballina accommodation to suit your needs. With several options, it can sometimes feel like guesswork choosing the right hotel or motel. Instead of playing lodging roulette, why not consider a few different aspects for your stay and discover what will best accommodate you? With these 7 simple tips, you can easily choose the right Ballina hotel for your upcoming holiday. 1. Look for a central location. When enjoying a coastal town, a location by the water is the ideal spot. But at the same time, most guests prefer to have easy access to shops, restaurants, and other amenities. 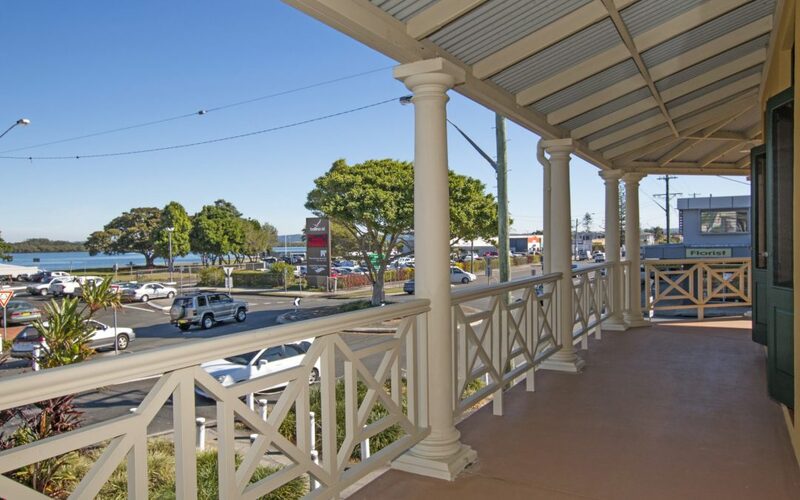 The Ballina Heritage Inn is not only one block from the ocean, but is perfectly situated within walking distance to everything you might need. We have the best location in town. Good (and bad) reviews are very telling. With services such as TripAdvisor, it’s easy to see what locals and visitors rank as the best Ballina accommodation options. With nothing but positive reviews, you can feel confident choosing a top rated inn for your lodging. And with 4 stars and a #1 rating, we showcase our ongoing commitment to quality. 3. Consider your travelling party. While different settings are appropriate for different types of holidays, you’ll want to select the hotel which will best fit your family or group. The Ballina Heritage Inn offers a range of rooms that can suit parties of varying sizes and travel purposes, including rooms with multiple beds or bedrooms. Looking for luxury or romance? Ask about our lovely Heritage Room. 4. Remember service over flash. Is bigger always better? We don’t think so. Our inn is modest in size, but that doesn’t equate to a lack of great service! Our staff is dedicated to top notch guest care throughout your stay, and we think our cosy size allows us to provide an even more personalised and special experience. We tend to shy away from “flashy” or trendy styles. But our old-fashioned Ballina hotel has a heritage spirit and an atmosphere of class and elegance which is all its own. And we think you’ll just love it here. 5. Seek out Ballina accommodation with a personal touch. A locally-owned and operated motor inn, we strive to deliver a personalised experience for each guest. Our special touches make all the difference: a crystal clear salt-water swimming pool, full breakfast room service, and outside seating overlooking our well-tended gardens. 6. Focus on your needs. Every guest is unique and will be looking for specific elements during their holiday in Ballina. You deserve a hotel which will accommodate those needs. Our inn boasts variety in room sizes, in-room amenities, parking, and more. A ground-level room with ramp entrance for guests with mobility needs is also available. Not sure if we offer what you require? Just ask! Whether you’re travelling for business or pleasure, comfort is important, and should be one of the primary considerations when booking your motel or hotel. With sizeable rooms, ample parking, and air conditioning units to keep it mild year-round, we know you’ll feel great here at Ballina Heritage Inn. And our team will do whatever it takes to make your stay even more comfortable and relaxing. We invite you to come and experience Ballina accommodation with a difference. Emphasising a memorable, pleasant, and peaceful stay during your time in the region, we know you’ll leave refreshed, rejuvenated, and ready to book for your next holiday!